Martial Arts Trends: The Why of It. My journey in the martial arts started in high school at Culver Academies, where I was involved in a sport every season all four years. I played football, ran cross country, rowed crew and wrestled, the first of my martial arts, in addition to being taught an introduction to Boxing and Fencing, also martial arts. I was enamored with wrestling, gaining a number of varsity letters in that and in crew, but the rest I did because it was available, and I could. In undergraduate school, college, I attended Denison University and added to my cross country experience, my wrestling experience and trained in Shorin Ryu, my first oriental martial art. Many of the lessons I learned in college sport and training I have carried into my current training in the martial arts, though neither Culver nor Denison have anything to do with Why we teach martial arts now, though they both have much to do with how. I graduated with a BS in Physics and a job in research, as I attended Graduate School in physics. 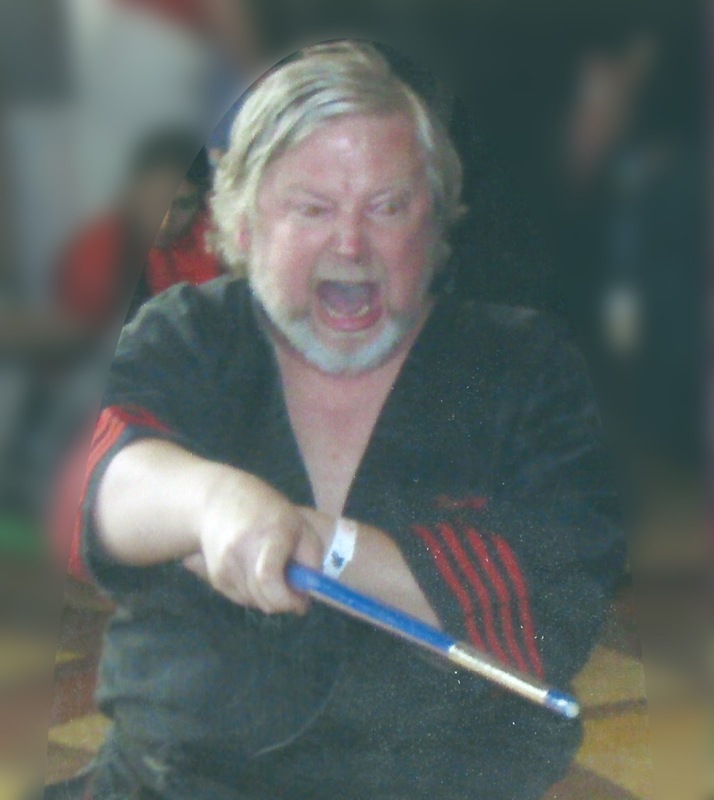 There was not room in my life for teaching or martial arts any longer. There was only research and academic advancement. Sure, my job made a product that helped people, textile joining, but I was the Microwave Laser guy, not the sting fabric guy. We Recently went back and found it - Still in Wrong. I continued to seek physical challenge however, and began to race bicycles in Criterion (100 mile races) and Time Trials, 25 mile sprints. In addition, I helped a friend start a regional bicycle club, and we began having an annual bike trip to Cape Cod. On one of these trips, the front wheel of my racing bike was caught in a poorly placed and improperly aliened drainage cover, and I flipped over on to my helmet at 35 miles an hour. They worked on my shattered shoulder. To be fair, the hospital did ask if I had been knocked out, but neither my wife or I knew, so they just gave me drugs and sent me home. Six months later I tried to run my car into on coming traffic, and at the last minute, I realized that this might end my difficulties, it would also take someone life other than my own, and that is what woke me up. I spent the next 30 minutes on the side of a dark country road shaking, and then I went home and told my wife what had just happened. That lead me to my doctor, who prescribed some awesome anti depressants, and he eventually sent me to a psychologist who within minutes told me I was not depressed, the drugs I was on were dangerous and that I had a brain injury. We went back and looked at the helmet. Sure enough, the inside lining was cracked. How did we miss that? The next step in the discovery journey was to a neuropsychiatrist who said the same thing, did some sophisticated tests, showed me a picture of the permanent damage to my brain and then explained to me that what I suffered from was: Migraines, Traumatic Brain Injury, Organic Affective Disorder, Loss of Impulse Control, Left Temporal and Frontal Lobe seizures, short and long term memory loss and an bunch of other stuff. The end result was two fold. First, he said that statistically I would be dead, divorced or in jail within a year, and second, I should take karate, because is might give me a small piece of self control where they really never was going to be any ever again. Obviously, the first thing did not turn out the way he thought, and that brings us to The Why Of It. By the grace of God and the skills I have learned in karate, I defeated the first prediction. I don't want to say everything has returned to normal. I am not a big fan of normal to begin with, but no, I am still permanently injured and will never be able to work for anyone anywhere ever again. However, I can teach karate with my family because of the Why of It. In the martial arts, since my injury, I have gained the ability to focus, where there was not ability; I have gain self respect, where there was only suicide attempts and medication; I have gain the Lord, where there was no faith of any kind; I have gained knowledge of my gift to teach. My wife, Anne. decided that she, perhaps we, would return the gift of life I received from my training and my faith in the martial arts by teaching it to others. That is why we teach. It was over 20 years ago and it remains so today. Every day we see people who gain inner strength, faith, courage, safety, knowledge, social skills, personal power and more. Every day we get testimony about what "we" have done to make someone else have a better life than before we met them. This is the confirmation that we accepted the Gift and have used it well. It is not reflecting in our own lives, but rather in the lives of our students. We have now taught more than 30,000 people in 5 countries and have come no nearer than when we began to being done. We teach, because we can change lives, and those whose lives we are changing keep coming back, bringing friends and family. We teach because we have changed lives. We teach because lives have changed us. We teach because it is what we were born to do. Awesome, well thought out emotional post. It needs to be seen by masses.